Hi. My name is Brian Hicks. I’m the founder and president of Angel Publishing, one of the largest and most trusted investment think tanks in the world. So there’s very little that takes me by surprise in the world of investing. But if you’d told me three years ago that I’d be not just invested in the marijuana market but getting filthy rich off of it, I’d have said you were out of your mind. Yet, a few months ago, something came across my desk that I couldn’t ignore. It was the name of a stock that I knew I had to buy. I didn’t call the company CEO, and I didn’t delve into the firm’s 10-K report. Instead, I immediately logged into my brokerage account and purchased 1,000 shares. My only regret now is that I didn’t buy 10 times that amount. You see, right after I made my purchase, the stock promptly went on an 89% run. But the big story here is why I even bought this stock in the first place. Something that caught my eye so quickly I felt like a little kid on Christmas morning. When it comes to the whole pot craze, I’ve been perfectly content to watch from the sidelines. But on the morning of November 16, 2017, that immediately changed. It’s all thanks to a man by the name of Briton Ryle, one of the sharpest financial minds in the country — a man I recruited to my team of analysts more than a decade ago. He’s generated millions for himself and readers alike in the 20 years since he first stepped foot on the floor of the CBOE — one of the largest trading floors in the world. But despite his tremendous track record in all market sectors, there’s one in particular that’s made him an absolute legend in investing circles. I don’t read charts. I don’t browse the financials. I buy immediately. And I buy a lot. Because every time I’ve listened to Briton, I’ve always made money. In fact, I’m going to share with you the actual results from my personal brokerage account. At first glance, these stocks will appear to have absolutely nothing in common. But when you get down to it, they ALL share one very important trait. One of the stocks Briton recommended to me goes by the name of CoreSite. I bought. And I bought without the slightest reservation. On March 17, 2014, I bought 600 shares of CoreSite. And so did hundreds of those who are lucky enough to have access to Briton’s otherworldly ability to make massive gains in one very specific — and unique — market sector. Exactly what I expected: CoreSite shares went crazy. Inside of a month, the stock shot up 50%... 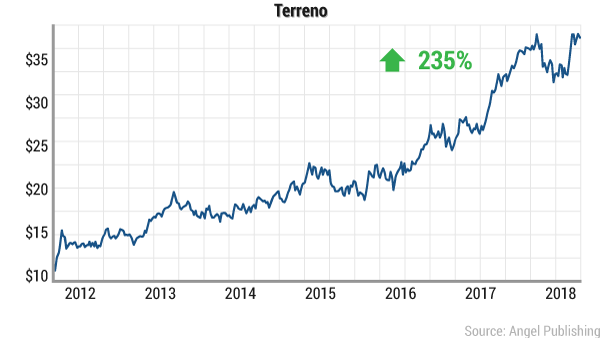 In two months, it was up 80%... and by the time a year had passed, the stock had exploded for a 230% gain. And today we’re sitting on nearly 400% in profits. Thing is, this wasn’t a one-off. Thanks to Briton, I was also in on Realty Income Corp.
Like CoreSite, there’s nothing that stands out at first glance. But Briton was confident the stock was about to pay big-time gains, so like always, I bought without hesitation. This time I bought 1,000 shares. And Briton’s knowledge paid off almost immediately. Those who got in with me saw 258% gains come rolling in. And we’re still making money on the stock today! So, as you might imagine, today’s opportunity is no different. And already, the stock has shot up by 89%. But that doesn’t mean you’ve missed the boat. Far from it. In fact, this particular opportunity is poised to be Briton’s best recommendation in his history with Angel Publishing. Because the specific kind of company Briton is known for pinpointing has a history of paying out absolutely massive gains. 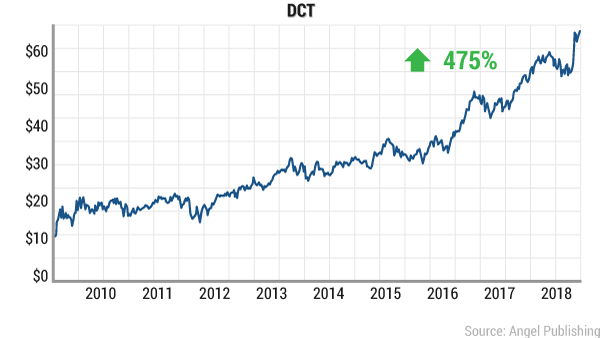 Back in 2009, an industrial company by the name of DCT was trading for around $10. No one was really paying attention to it. Except for Briton. After all, this company was in the overlooked market sector that he absolutely loves to make mountains of cash from. As you can see, shares climbed from $10.56 all the way to more than $60. And it wasn’t a roller coaster ride, either. The stock went on a steady climb, netting investors who timed it right 475% paydays. Around the same time, something similar was going on with logistics company Prologis. And it was trading for just a bit more — around $12 per share. Again, Briton was one of few paying attention. Like clockwork, the stock rose from $11.91 to more than $66. Or every $1,500 into $8,340. And this cycle of massive gains from this very specific market sector has turned over and over again. And these are just a few of the huge gains in-the-know investors had the chance to pull in. Thing is, at first glance, all of these companies look very, very different. Some are industrial companies... some deal in data... some are department store firms... and today’s company does business in the marijuana market. Every last one of these companies owns, operates, or finances income-producing real estate. In short, each of these companies is something known as a REIT. And as you’ve seen, Briton is an outright wizard when it comes to finding the biggest profit opportunities in this overlooked subset of stocks. Today’s recommendation is no different. But it doesn’t grow it. It doesn’t sell it. It doesn’t make equipment for it. What it does is provide space for it. And as you’ll see right now, the demand for space in the marijuana industry is going parabolic. And this is still the beginning. 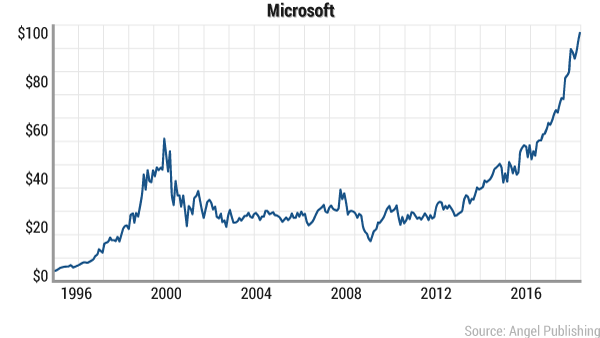 This market is less than a decade old, and it’s already grown faster than the tech industry did during the dot-com boom. CBS News and Yahoo Finance report that the industry is expected to grow as large as $44 billion a year by 2020, more than 400% what it is now. That’s just two short years away. And it goes without saying: The bigger this market gets, the more space growers will need. That puts this company, “the only pot stock I will ever own,” in a ridiculously profitable position. Take Aurora Cannabis Inc. (TSX: ACB) for example. To put that in perspective, that’s bigger than 21 football fields! The Cronos Group (NASDAQ: CRON) expects to have its new 286,000-square-foot indoor grow facility in full production by summer 2018. Canopy Growth Corporation (TSX: WEED) is in the process of expanding its flagship facility known as Tweed Farms from 350,000 square feet to 1 million square feet. Future Farm Technologies (CSE: FFT) plans to scale its cultivation of industrial hemp by 1,100 acres a year starting in 2019. Aphria Inc. (TSX: APH) is building a 1 million square foot facility that is expected to be up and running next year as well. And that’s where our REIT comes into play. It provides one thing and one thing only: the land for companies like these to build their grow facilities and botanical laboratories. The demand for real estate is so incredibly high that our REIT has more than doubled in size since its inception in December 2016. And with 10 more U.S. states as well as the entire nation of Canada poised for legalization, demand for its services has nowhere to go but up. New Jersey, Michigan, Missouri, and Utah are all expected to legalize cannabis in some form by the end of this year. Each time a new state introduces medical or recreational cannabis laws, the size of the market increases by millions of people! And demand skyrockets every time this happens. In fact, there are already more than 2,100 registered dispensaries in the U.S., and that number is steadily growing. Fact is, real estate is something that every single cannabis grower needs — whether it be medical or recreational, American or Canadian, legal or illegal. It’s the common thread that ties this whole industry together. Without land, there would be no pot. And as long as this market continues to flourish, the demand for real estate will stay astronomically high. That’s why “the only pot stock I will ever own” is both a pot stock AND a real estate stock. Point blank, it is leading the charge on marijuana real estate. And that puts it in prime position for record-breaking profits! Marijuana is estimated to be a $45 billion-a-year industry. But legal sales only account for about $7 billion of that. However, major news outlets like CNBC and Yahoo Finance project that legal sales will reach $44 billion within five years! Point blank, marijuana is the fastest-growing commodity in the world. 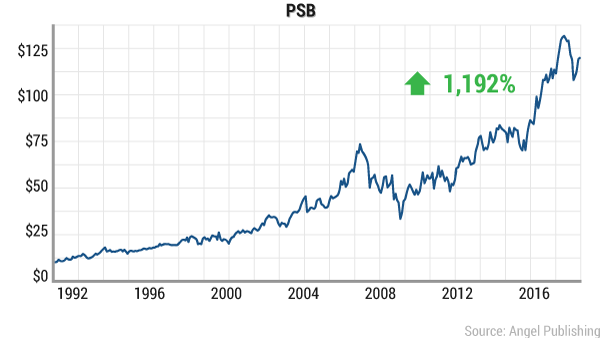 It’s already surpassed the growth of the dot-com boom by an order of magnitude. That makes the growth of the industry very stable. Since marijuana prohibition has lasted close to a century, the bulk of marijuana is still bought and sold on the black market. But every year since the first wave of legalization, more and more of those sales have hit mainstream retail markets. This created a huge opportunity leading to the licensing of more than 2,000 dispensaries around the country. Everyone with an entrepreneurial spirit and green thumb is trying to strike it rich off this brand-new market. There is no Apple or Google or Amazon dominating this market, which leaves the door open to small businesses and healthy competition. There is, however, one REIT quickly snapping up gargantuan tracts of land crucial for the growth of this industry. The outrageous profit potential of this industry stems from the lack of competition. As I mentioned before, there are no $800 billion mega-corporations dominating the space. New companies don’t need hundreds of millions in venture capital just to get their feet off the ground. Many of the dispensaries cropping up all over the country are started by families with their personal savings. Here in Baltimore, a high-traffic dispensary was recently opened by the wives of the owners of a popular local bar, MaGerks. Denver-based cannabis distributor Medicine Man was founded by two brothers and a sister who turned a single piece of a land into an $8 million business in their first year! Success stories like these are persuading more and more folks to throw their hats in the ring. And that’s great news for the industry. Because the more people want in, the higher the demand for its services will be. And while it sounds like there are a lot of players in the game, they still have effectively zero competition. In fact, there is not a single other stock exclusively dealing in cannabis real estate. This company already provides more than half a million square feet of real estate to cannabis companies around the country, and that is steadily growing. If you look at the history of just about any growth industry, you can see a massive advantage for the first movers. 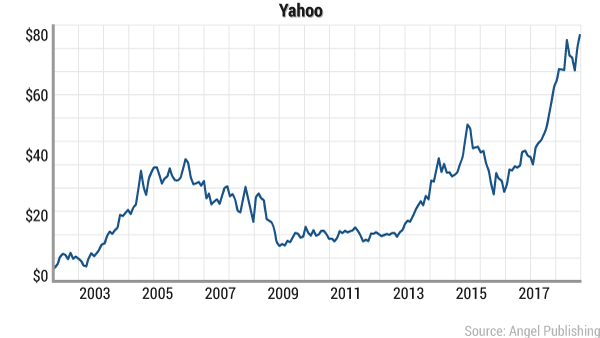 Yahoo and Microsoft were two of the first software companies in the dot-com boom, and they are still titans of the industry today. 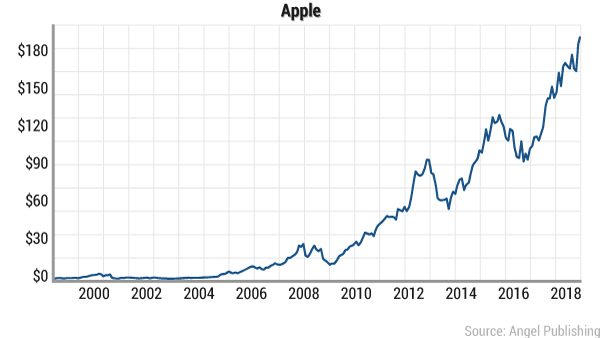 Apple was the first in the smartphone game, and it is now the most valuable company on the planet. 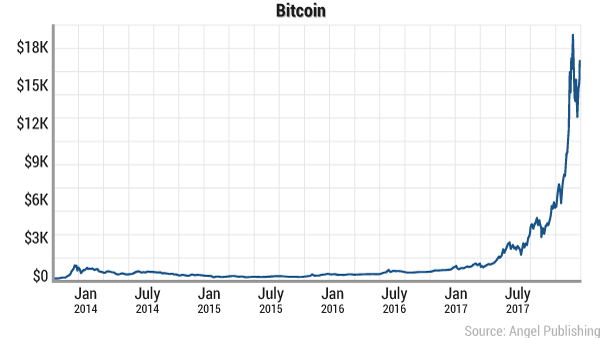 Bitcoin was the first cryptocurrency, and despite using outdated technology, it’s still the most valuable crypto AND the most profitable investment of all time. And that’s a big factor in why this company is so exciting for investors. At this point, we know pot companies will make us money. But there are so many ways to play it, it’s hard to say which avenue will yield the greatest profits. But if there is one thing I’ve learned from Briton in the last decade, it’s that real estate ALWAYS pays. It doesn’t matter the industry, it doesn’t matter the location. All that matters is that EVERYONE needs space — for any business of any kind. “The only pot stock I will ever own” is what you might call a pick-and-shovel play. That term comes from the days of the gold rush. Everyone wanted to mine gold back when it was first discovered in California in the 1800s. But if you packed up all your things and carted your family 3,000 miles across the country, you weren’t guaranteed to find any gold. It was a risk that a lot of people took because they knew there was a big opportunity. But the people who made absolute fortunes were the ones who realized the real money was in providing the tools necessary for prospecting. They were selling picks and shovels by the boatload. They never had to see an ounce of gold to strike it rich. They took no risks and had no need for luck. And yet they still made out like bandits. And that’s essentially how today’s recommendation is positioned. It dominates the market for the land needed for cannabis to grow. It never has to touch an ounce of pot to make millions. Frankly, it is already doing exactly that. In fact, REITs tend to be some of the most consistent profit engines on the market because of the “picks and shovels” nature of their business model. Take CoreSite for example. You might recall that I bought 600 shares at Briton’s behest. And you’re about to see why. CoreSite provides data centers for Fortune 500 tech companies. It didn’t have to create any revolutionary tech or participate in the dot-com boom. All it does is provide the facilities for companies like Apple, Google, and Amazon to house their servers and critical data. It doesn’t matter if the newest iPad flops. Apple still has to pay its landlords. 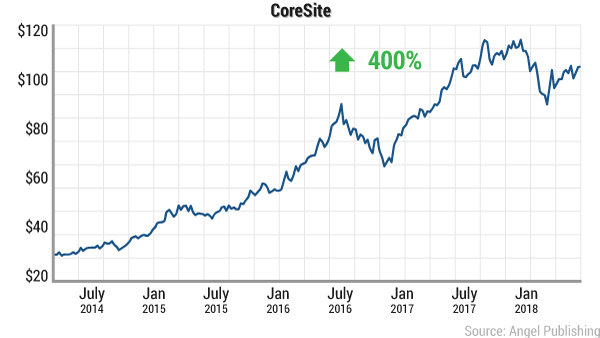 And CoreSite’s share price has skyrocketed accordingly! REITS are such a powerful profit machine that they don’t even have to be in a booming industry. Realty Income Corp., which I bought 1,000 shares of at Briton’s recommendation, has no stake in tech or pot or any other sector that’s wildly popular. Instead, it banks on regular guys like you and me going about our day as normal. It owns hundreds of Walgreens, dollar stores, and gas stations. 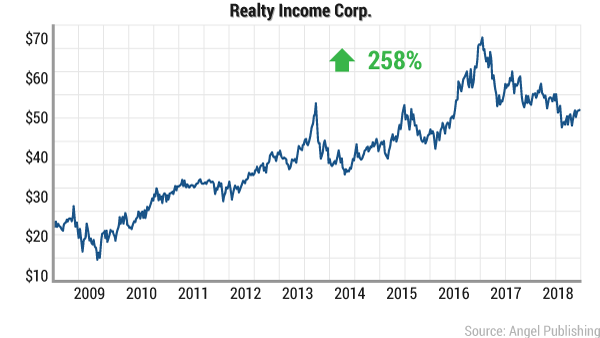 As long as people keep shopping, driving their cars, and going about their business as usual, Realty Income Corp. sees massive profits. And as expected, people have kept on doing these things for the entire lifespan of the REIT. Most people don’t go into a Walgreens wondering who owns the land it was built on. They just think it’s a Walgreens where they can buy food, medicine, and other odds and ends. This is what makes Briton’s knack for spotting these opportunities so incredibly valuable. Most REITs are unassuming and don’t jump out at investors. But the market always recognizes their value. 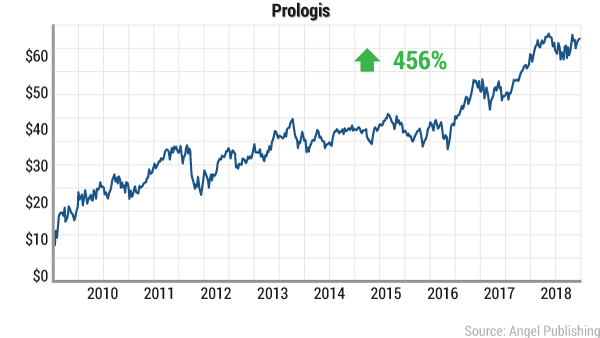 Prologis (NYSE: PLD) provides warehouses and distribution facilities for trucking and delivery companies, and it’s up 181.5% since its IPO. 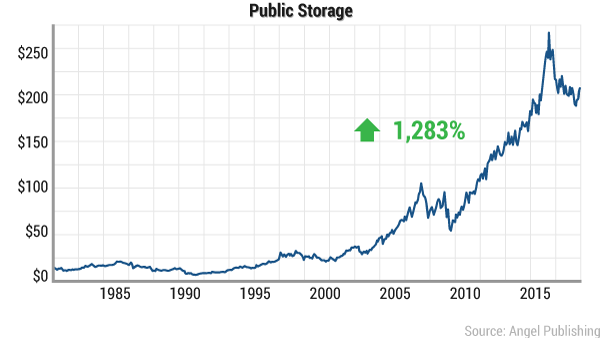 Public Storage (NYSE: PSA) is very well known for its self-storage facilities, and its stock is up a whopping 1,283% since its inception. 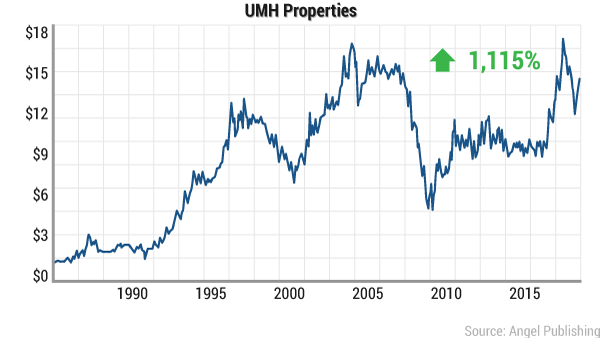 UMH Properties (NYSE: UMH) builds housing communities — swimming pools, fitness centers, playgrounds, and the like. Its stock is up 1,115% since it was founded and shows no signs of stopping. These companies are ALL in the same line of business as today’s opportunity... except today’s recommendation deals in the hottest commodity the planet has to offer — bigger than anything we’ve seen since the dot-com boom. You NEED land to conduct business. And that critical undercurrent of value and consistency, coupled with the unprecedented growth of the pot industry, means this could be the BEST play Briton has EVER recommended. This is going to be the profit ride of a lifetime. Briton Ryle is the master of picking this particular kind of stock. Fact is, he’s the best I’ve ever met. And that’s why I recruited him to work here at Angel Publishing! Briton is the investment director of The Wealth Advisory, one of our premier investment research services. 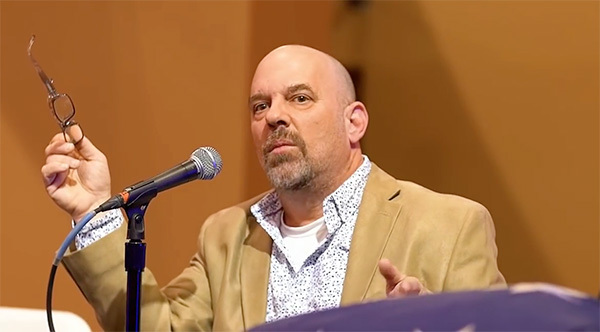 You may have seen him at the MoneyShow, heard him speak on a national investment panel, or listened to one of his countless radio interviews. You may have read one or both of the bestselling books he collaborated on: Hot Trading Secrets and The Small-Cap Investor. But for those of you who don’t know him, he is obsessed with beating the market and showing people they don’t have to be market insiders to get ahead. In the 20 years since he stepped on the floor of the CBOE for the first time, he’s unearthed the smartest and most explosive investment strategies that Wall Street doesn’t want you to know about. He’s used these secrets to generate over $2 million in gains, and there’s no telling how much money those listening to him made. Briton created The Wealth Advisory to help investors from all walks of life secure long-term profits without buying anything risky like penny stocks, options, or cryptocurrencies. Because the real secret to making money from the stock market doesn’t involve leverage tools, day trading, or trying to jump aboard the latest bandwagon and cash out before everyone else. Instead, the most money is made from low-risk investments with good long-term growth potential. These investments give you financial security AND grow your wealth at the same time. Just smart, safe investments that leave you confident and happy. His readers have safely doubled and tripled their money again and again. Simply put, we listened to Briton, and we’re making a killing! But in all my years in the markets, I’ve never seen a market boom like the legal marijuana industry. I watched for five years as the legal cannabis market blossomed. But it wasn’t until quite recently that it stabilized well enough to make safe investments. After pouring countless hours and tens of thousands of dollars into his research, Briton was asked to speak on an investment panel at the Cannabis Cup in California. If I had any doubts about the future of this industry before that, they were completely wiped out. There were thousands of eager entrepreneurs and investors itching to get their hands dirty. And it made me realize that I’ve never been as sure of an opportunity to grow your wealth as I am today. Ever since the first states legalized pot in 2012, I knew this sector would create fantastic wealth for those involved. It was very volatile and hard to predict at first, but now we’re starting to see the real winners and losers emerge. This is the closest you can get to a sure thing. In 30 years of financial research, I’ve seen a lot of stocks rise and fall. But in all my years in the markets, I’ve never seen anything like the stock I am telling you about today. It doesn’t just satisfy every criterion I have for buying a stock — it blows them out of the water. With strong leadership, pristine financials, massive growth potential, and a dominant market share, this company is every investor’s dream. The executive chairman of this company is one of the most successful real estate CEOs of all time. After 30 years of unparalleled success, he has become a legend in the real estate industry. His first company was named by Forbes as the #1 real estate stock to own while he was at the helm. He grew his second company 1,800%, from $405 million at its IPO to $8 billion at its sale! And now he’s betting big on medical marijuana. This company has assets worth MORE than its market cap. It is the very definition of undervalued. On top of that, it has ZERO debt. Not only is zero debt incredibly rare, but it’s also incredibly valuable. These days, practically every major company maintains some amount of corporate debt. Tech giants like Amazon, Apple, and Google carry HUNDREDS OF BILLIONS of dollars in debt. Sure, they have the cash flow to support it, but a significant dip in revenue for them could be catastrophic! But this company is free from that concern. It has no bare minimums to reach. It doesn’t have to cut corners just to make ends meet. It also doesn’t worry about interest rate hikes, banks seizing its assets, or financial institutions going belly-up like they did in 2008 and again in 2012. Instead of spending resources on lawyers or contingency plans, it can devote all its time and money to building and growing the strongest company possible. The long-term growth potential here is perhaps the most exciting part of this company’s resume. It’s already signed multi-year contracts with cannabis producers all over the country that GUARANTEE increased revenue year after year. And it has its sights set on states that are currently moving towards legalization. As more states introduce legal cannabis programs, no one will be better prepared to take over their emerging markets. In fact, every time a new state passes pro-cannabis legislation, stocks go vertical. 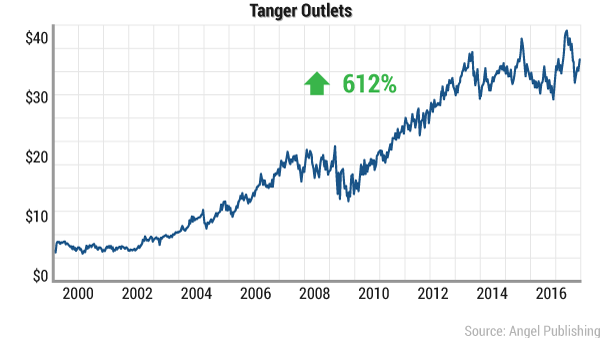 CannaGrow Holdings (OTC: CGRW), a grow house builder headquartered in Denver, shot up 3,166% in just one year. United Cannabis (OTC: CNAB) began its run on February 10, jumping 34,233% in less than two months. Green Cures Botanical (OTC: GRCU) jumped 53,200% in a span of four months. 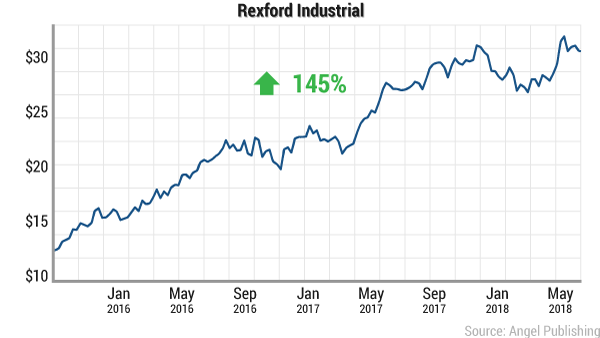 Hemp Inc. (OTC: HEMP) surged 1,933% in three months. 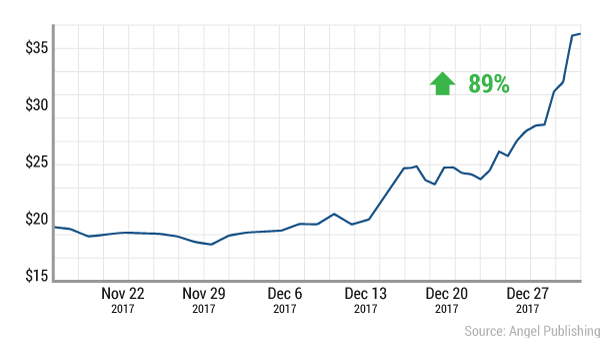 General Cannabis Corp. (OTC: CANN), a marijuana-consulting firm, soared 1,421% in three months. Of course, Colorado is a saturated market. It was saturated before the company I am telling you about today was even founded. But there are still 22 states left to legalize marijuana in some form or another. 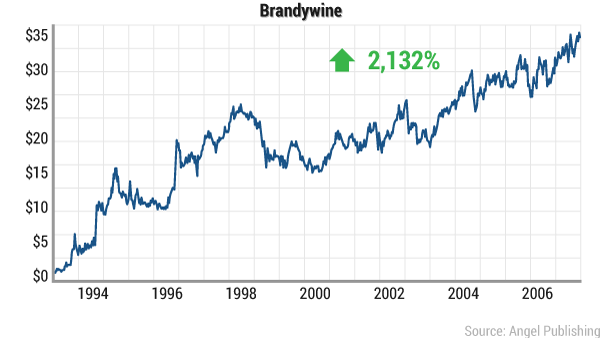 And 22 more chances for its stock to go parabolic AGAIN. These guys are the only game in town... and they know it. There is not a single other company on a major exchange with the same business model. It already has a 50% market share in two of the four states it operates in. This gives it a level of freedom that very few companies have. It doesn’t have to worry about being beaten to market or playing catch-up to meet industry standards. It is setting the industry standards. It doesn’t have to worry about patents or intellectual property lawsuits. It can devote all of its resources to growing its reach and solidifying its stake. Without competition, there’s nothing stopping it from being the dominant force in this market. As I mentioned before, this is a once-in-a-decade stock. You’ll never forgive yourself if you miss the chance to cash in on this mega-trend before it reaches critical mass. But just like the gold rush it’s named for, the real winners here are the ones selling picks and shovels. And that’s exactly what this company is doing. It doesn’t grow or sell any cannabis. It isn’t subject to state licensing or federal drug law. It finances long-term operations with massive growth potential. It provides investment capital and long-term stability to support growth. And every month, it sends a check to every single shareholder for their percentage of the profits. When they win, you win. It’s as simple as that. And I’ve convinced Briton to give you all of his research on this company completely free! All I ask in return is that you take a risk-free trial run of his investment service, The Wealth Advisory. The goal of The Wealth Advisory is simple: to get you reliable and consistent profits month after month, year after year. If you follow Briton’s research each month, you might never have to worry about running out of money ever again. Finding great opportunities that no one else is talking about isn’t his job; it’s his passion. We’re constantly looking for new types of investments... but only ones that promise to grow your wealth for the long term. We don’t invest in any flash-in-the-pan type stocks. But we also don’t shy away from big gainers just because they’re going to move fast, either. We’re looking for the next long-lasting trend in the market and the global economy. And build the kind of wealth that gets passed down from one generation to the next. You’ve likely heard of Uber by now. It’s the now-famous ridesharing company. Back in 2011, the company was valued at just $316 million. Today, it’s valued at a whopping $62 billion, having grown faster than any company in history. Turning every $1 into $195 and every $5,000 into $981,000! But because Uber is a private company, you can’t invest in it. Right? Briton found a little-known way to play Uber’s meteoric growth right through the stock market. You could think of it as a “backdoor” into Uber. In short, it’s a small tech company that’s responsible for powering Uber’s app. Uber is just one of its many clients. This company’s customers also include Walmart, Facebook, and Airbnb. These recognized brands simply wouldn't be able to function without their apps. And it's what makes this tiny company’s software so valuable. Best of all, this report is 100% FREE. 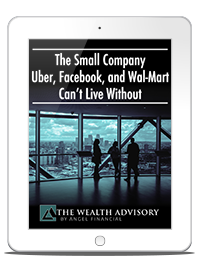 And you’ll get it delivered straight to your inbox as soon as you sign up for your trial run of The Wealth Advisory! But that's not all you'll get. While many Americans work well into their golden years, some savvy folks are living out their retirement dreams. And no, they didn’t buy lottery tickets, take on second jobs, or invest in time-shares. It's the culmination of Briton's 20 years of experience in financial markets. Briton and his team spent hundreds of man-hours tracking down and compiling this information. I can say with utmost confidence that this is a collection of income-boosting tips and tricks you won’t find anywhere else in the world. It contains some of the hardest-hitting and most explosive investment secrets that Wall Street doesn't want you to know about. These are huge opportunities for you to shave off the years until your retirement, to grow your wealth so you won't have to work until you're 70, to establish multiple streams of rich income, and to live a lifestyle you never thought was possible. Retirement Cheat Sheet Tip No. 1: Wall Street’s Best-Kept Retirement Secret — A stock market “loophole” gives you the opportunity to bank $5,000, $15,000, or even $50,000 or more in extra annual income — starting with $50. You won’t hear about this from your broker, but once you know how it works, you’ll probably never want to use a broker ever again anyway. Retirement Cheat Sheet Tip No. 3: Bonus Cash From the U.S. Government — There’s a secret loophole that allows you to legally collect anywhere from an extra $5,000 to $20,000 in extra government cash each year. You’re eligible to pocket this government cash regardless of your age or marital status. It also doesn’t matter how much you pay in taxes. The money you’re getting isn’t a loan, and there’s nothing to pay back. Retirement Cheat Sheet Tip No. 11: Get Paid to Golf Without Being a Pro — Did you know there’s a way for you to earn up to $50 an hour by golfing? And you don’t even have to be good at golf. Best of all, you can do this at your local course. In fact, it contains 21 tips in total. But knowing just one of them could be your key to unlocking a wealthy retirement! 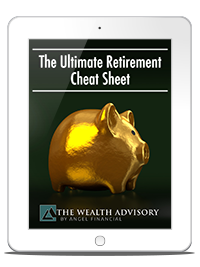 And like the report I mentioned earlier, you'll get “The Ultimate Retirement Cheat Sheet” 100% FREE. All you have to do is sign up for a risk-free trial of The Wealth Advisory. 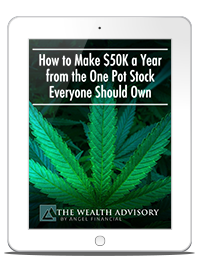 The moment you sign up, you'll get a detailed report called “How to Make $50K a Year from the One Pot Stock Everyone Should Own,” complete with the name, ticker symbol, and all the other details you need to invest in this amazing, once-in-a-decade opportunity. You'll even get exclusive details from my “off-the-record” interview with its CEO and CFO. Bonus Report No. 1: “The Small Company Uber, Facebook, and Walmart Can’t Live Without” — This small software firm powers the apps of today’s most recognized brands, including Uber, Facebook, Walmart, Airbnb, and more. In the report, you learn what this company is, why it’s such an outstanding opportunity, and how you could cash in on the action, too! Bonus Report No. 2: “The Ultimate Retirement Cheat Sheet” — This one-of-a-kind cheat sheet features 21 powerful income secrets that Briton discovered over the course of his 20-year career. These are the kinds of moneymaking secrets a broker will never tell you about — usually because they would cut into their profits. They are available for every American, no matter where you live. One Full Year of The Wealth Advisory (12 issues total) — On the third Wednesday of each month, we’ll email you the latest issue. These issues are bursting with tips, insights, and opportunities for collecting the most amount of extra income with the least amount of risk. Confidential Wealth Advisory Alerts — As a member, you’ll never be left in the dark between issues. You'll receive timely action alerts by email whenever conditions warrant. 24-7 Access to Our Members-Only Website — You’ll also get secure access to The Wealth Advisory's member website. There, you’ll find every issue, special report, and action alert, as well as the complete Wealth Advisory portfolio — currently up a whopping 1,515.98%! Friendly, Full-Care Customer Support — We want to make sure you succeed. So we’ve assembled a top-notch team of customer care reps for taking care of you and answering any questions you may have. Call us anytime during our regular business hours of 9:30 a.m. to 4:30 p.m. (ET). That's a pretty full slate of benefits. But most importantly, you'll have the power to profit consistently. And that's our main goal: to help you earn consistent and steady profits, year after year after year. Of course, I'm sure by now you're wondering just how much it costs to become a trial member of The Wealth Advisory. I know services like these often charge $1,000... $2,000... even as much as $5,000 per year for similar information. But I want Briton’s research to be accessible for everyone, especially the people who need that extra edge the most! So, I've decided on a price that’s a mere fraction of that figure. Normally, we charge $99 a year for Briton’s premium research. But today, I want to show you just how confident I am that you’ll stick around for years to come! If you sign up within the next 24 hours, it’ll only be $49 for a full year’s membership. That's a 50% discount from the regular price — it comes out to just $0.13 a day. This is an absolute steal considering you could make that back on a single trade! I will say, though, that this is a limited-time offer. If we offered this deal every day, we wouldn’t be able to keep the lights on here. But I am so excited about this stock that I want absolutely every single one of our readers to have a chance to get in on the ground floor of a decade-long profit run. So, if you're interested in “How to Make $50K a Year from the One Pot Stock Everyone Should Own,” I urge you to lock in your spot today. Opportunities like this are incredibly rare. And with the massive amount of information you’re getting FREE of charge, trying out The Wealth Advisory is a no-brainer. Become a member today, and you'll be locked in with no risk and no obligation. Take six months to decide if The Wealth Advisory is right for you. During that time, you'll have full membership access. You can log into the private members-only site, check out all the special reports, and view every update Briton’s ever posted. If you find The Wealth Advisory isn't what you thought, just let me know and I'll refund every penny you spent on the subscription — no questions asked. And any information, reports, or profits you received courtesy of our service are yours to keep. But I'm confident it'll never come to that — once you see how easy it is to start building consistent, long-term wealth. I'm a firm believer that a year from now, you'll thank yourself for taking the plunge. The only thing left to do now is click below to get started.